This week will mark the six-month anniversary of Lindy’s passing. How are we? Well, we’re smiling more when we remember her and crying a lot less. Each day that goes by, we get a little better. Life will never, ever be the same for us, but we’re embracing the future with more hope than grief now. We lived, we stopped living, now we’re moving forward again. A large semi-colon called cancer placed a huge period and now a comma in our lives. And, with hope comes new possibilities and a renewed sense of who we are as a family of five minus the one. Now, I am trying to re-find myself. Who am I? I lost who I was many years ago. The illness, care-giving and caring for the kids and about everything else wore me down to the point where I couldn’t find joy in anything. I realize this now as I am healing and finding that joy and happiness back. Looking back now, I’m so thankful that I’m at a place where I can see that. There appears to be a light at the end of the long, dark tunnel. Lindy told me she wanted me to move on with my life. I thank God that she and I were able to have those gut-wrenching conversations while she was still here. I would hold her and sob telling her that I couldn’t do it alone. She would assure me that the kids and I would be okay. I can still hear her on her deathbed reassuring me as she slipped away. You know, she was right – I am (we are) doing it (thanks to a large supporting cast). The semi-colon says stop, breathe and then start again. 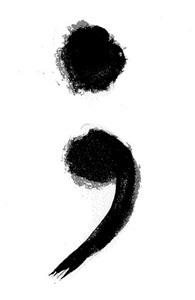 To me, the semi-colon is a poetic symbol for the story of our lives. This entry was posted in Coming to Terms, Feelings, Grieving, Uncategorized and tagged Cancer, Capturing Memories, Caregivers, Dealing With A Spouse With Cancer, Grief, Life Changing. Bookmark the permalink. We pray for you every day, trusting God to continue to fill you with His hope through Christ! What a beautiful imagery of the semi-colon! I think about you guys often and I thank God that you are doing as well as you are. It is certainly by the grace of Him that life goes on. Each breath we take is from Him. 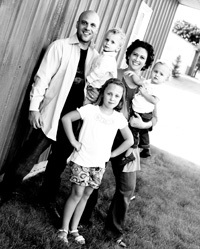 Thanking and praising Him with you and trusting God for your wonderful future with your beautiful children! Beautifully said. Praise God for more healing! As Easter approaches, you are more heavily on my mind. I know how hard holidays can be as the wounds of loss and the brokenness can seem somehow rawer and fresher. But this holiday. Oh, this one… I hope it brings you joy and continued peace as we celebrate Christ’s resurrection and rest in the assurance that some day your family will be reunited in a heavenly home, rejoicing at the feet of God. PS – Your writing and its imagery are powerful. Thanks for laying it out there. Redefining oneself is such a vulnerable and scary thing, but you are doing it with such quiet strength and grace. You’re nothing short of an inspiration. An interesting discussion is worth a comment. I believe that you should write extra on this subject, it may not be a taboo subject however generally individuals are not brave enough to talk on such things. Cheers! I want to use some of this material on my website. I’ll give you a link in the site if that’s okay with you.